That phrase sounds militaristic, and to some that may be intimidating. I don't use that phrase to conjure up images of tanks and warplanes. However, In the business world, taking command is about confidence and understanding. When your mind creates an image of someone taking command, it probably goes to someone in a control room. With the right information displayed in a meaningful way, that control room operator sees what is happening now and can anticipate the future. This is where your business must be if you are to remain competitive. Put yourself in the mental state of that control room operator. Feel what it's like to know everything that is happening in your business right now. What are your salespeople doing? What messages are your marketing experts creating? What are your customer service representatives helping your leads and clients with? How much is all that costing? Are you getting a return on your investment? The successful businessperson responds with a confident, “yes”. The reality is most business owners don't have that confidence. It's hard to avoid that continual draw to work "in the business" and not "on the business". The more we are stuck in the weeds, scrambling to keep everything afloat, the less we can be strategic and proactively remain competitive. Every business owner and manager on Earth struggles with this. You are not alone. Taking command comes down to one key element of your business - managing information. If you don't have enough information presented to you in a way you can quickly understand, you’ll easily get lost. This is exactly why we built GreenRope, and why our slogan is "Take Command. Create Demand." In the old way of managing business, everyone was responsible for their department, to do their job. The need to collaborate wasn't a part of culture because 1) it's hard, 2) you're not judged by it, and 3) people use information as power over each other. But times are changing, and this won't fly much longer. There's an expression you might hear, "the inmates are running the asylum." This happens when the authority for strategic decisions is delegated too far down. In technology companies, it can happen when developers drive product direction. In a marketing company, it can happen when the marketing message doesn't match the product ("but this ad is so cool"). In sales, it happens when salespeople say they don't want to use a CRM because it distracts them from their job. When the inmates are in charge, the company slips and slides and takes detours on the way to success. Weak leadership will sit back and allow departments to run their own isolated empires. "Management by Exception", or only stepping in when someone breaks the rules, is the slow, decaying process of letting the status quo reign while the world changes around the company. Taking command of your business means you accept the yoke of responsibility to lead your company. You're not leading it just anywhere - you have a strategy, a vision. But that vision must be tempered by the market and your company, and without a centralized way to manage information, you could be leading your troops off a cliff. GreenRope is designed as a tool to help you control your business. How many times have you wondered if your salespeople are actually working? How much revenue is in the pipeline right now? Are our campaigns generating a positive ROI? How much does it cost me to acquire a new customer? How happy are my customers? If you can't answer those questions definitively, you're inching your way to bankruptcy. Luck may save you for a while, but in the long run, a more disciplined rival will win. It doesn't have to be that way, but you do have to take a step back and establish a culture based on your CRM platform. This culture is driven not only by collaboration, but by data as well. Sales is the lifeblood of every company, which is why CRM typically focuses on sales. If your salespeople are not using your CRM, their relationships are not connected to your business. When that salesperson leaves, they take their relationships with them. If you don't measure what your sales team is doing, you can't see how effective each person is. Without insight, you can't create systems or processes. This means that when new sales people join your company, you can't measure success or ways to replicate success and create a more effective team. The moment you let salespeople keep their records of calls, emails, meetings, and presentations outside your CRM, you lose control of your business. When you take command of sales, calls and meetings are logged. You can see how the relationships between your team and your customers develop. You can set up automation to help your sales team be more efficient. You can see what methods work, and focus on team members who need more help. 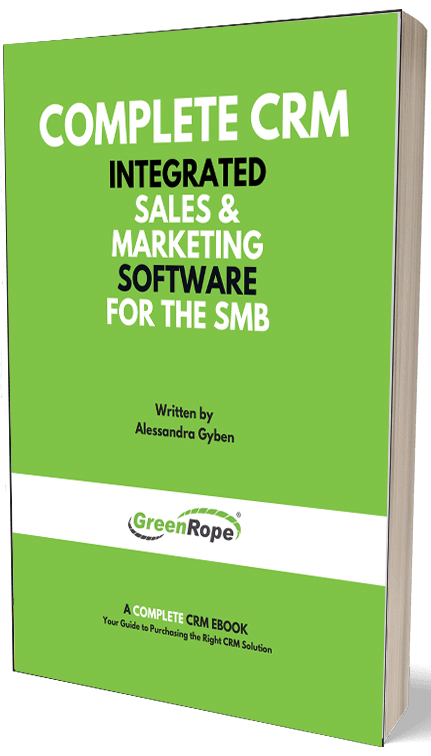 Recently, I talked to one of our Value Added Resellers (VARs), who said that using GreenRope's technology, he is able to increase a salesperson's funnel by 600-1200%. Automation and storage/retrieval of relevant sales information makes this possible. As the world embraces newer technology, your business has to move with it, or the free market economy will make you irrelevant. When your marketing team creates ads, they do it with the intention of attracting leads and converting those leads into prospects and eventually customers. Eventually, that action must lead to prospects becoming customers. The challenge is that in the modern world, there are hundreds, if not thousands of channels by which to reach people. Online or offline advertising can bring people to visit your website or call you, but it doesn't stop there. Taking command of your business means that you are able to trace what everyone does as they begin their customer journey. From when they first hear about you ("awareness") to when they decide to purchase ("conversion"), your marketing team must follow along and encourage that transaction. The added benefit is that your sales team can now see in realtime how their leads are responding to your marketing. This helps them sell better, while providing valuable feedback to your marketing team. It's all connected, and with information moving freely, both sales and marketing win. The right tools, combined with effective transfer of information make all the difference to the customer experience. If someone fills out a form, or starts a chat session, or emails a complaint to your team, a process must always take over interaction with that customer. It doesn't matter how much you trust your team, people make mistakes and forget things. Your CRM should make sure they don't. A good leader takes care of his or her people. A functional team knows how they contribute and feels good about the contributions each team member makes. Someone who answers the phone positively may glean information that will help a salesperson sell better, but if that information isn't in the CRM, that salesperson will never know. Leading these parts of your business requires the vision and strength to show your team how and why your CRM is needed and beneficial for everyone. You don't want to fight your team, so involve them in the decision. Show them how they contribute to each of the different departments. Customer relationships are multifaceted, and the better you understand them, the better your customers' experiences. On several occasions, I have seen companies with weak leadership give in to a sales team who wanted to remain mysterious and busy, like George Costanza would do in Seinfeld. "Look busy, and they won't bother you," is a recipe for letting everyone down, but it's a great way to get paid for doing nothing. Those companies, willing to trade that feeling of command and understanding so the sales team could remain unaccountable, all suffered. Sales dropped, chaos reigned, and in the end, the company culture become one of blame shifting and finger pointing. That is not leadership, that is fear. As a leader, like it or not, it’s your responsibility to define and uphold that culture. If you are going to run a business, or manage a department in a business, fear will prevent you from creating a culture that inspires and grows. Use your CRM as a platform to make your ideal culture pervasive. When everyone is accountable, everyone benefits and contributes, and as a whole, your business runs smoother. Take command of your business. Make it the well-oiled machine it was meant to be. You won't be fighting fires, you will be confidently evaluating where you are and where you want to take your ideas. It is more work at first, but in the end, you and your business will thank you.